Raja Ampat, the unknown beauty that has marvelous underwater life is a worth visit. Not just the underwater life, but also the people and culture is as beautiful as the landscape view. I spend my winter holiday 2016 in this archipelago and I have visited so many pretty places. You may also like the previous article Raja Ampat, Hidden Tropical Paradise. Kri Isla nd is one of the most popular diving destination in Raja Ampat. The famed Kri-Eco Resort is located in this island too. Nowadays there are lots of local bungalows own by the local people. I stayed in a bungalow named Koranu Fyak Bungalow. It isn’t a luxurious resort but it was enough for me to enjoy the serenity of the nature. Since the island is sort of remote, there were no car, no traffic. It’s a perfect place to spend your holiday, to run away from the busy city. I recommend this link for you to find the accommodation that fits your needs Stay Raja Ampat. There are lots of things you can do here, bird watching for example, snorkling, hiking and Trekking. Near by Kri Island, there is a famous place called Pasir Timbul which is such a white sand island. It’s amazingly beautiful, especially on the low tide. Unfortunately I was not there. One day when I come back, I will go there 🙂 . 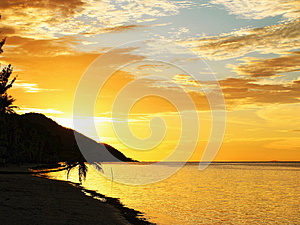 Everyday when the weather was good (mostly good), I enjoyed such an amazing sunset to the sea. Make sure to check out how the weather will be. In some months the weather is so bad and nobody could travel around. The wind causes such a big wave and the boat can’t operate on such a weather. Even some resort are completely closed at those months. In group we were planning to go to Fam Island (Pyanemo), the mini version of Wayag which is closer and for sure as well cheaper. Unfortunately, the weather was bad at that time, so the trip was cancelled. I was a bit disappointed because I was looking forward to go there. So then we traveled back to Waisai, rented some motorcycle and had small trip all around. I guess the most popular place there in Waisai is the WTC Beach (Pantai WTC). It is said that WTC is an abbreviation from Waisai Tercinta or literally translated as Beloved Waisai. It’s a bit indefinite because when I asked to several local people, they had different answers. The beach is not really a beach anymore in my opinion, some kind of wooden pedestrian path on the water had been built and land reclamation had been done there to make more space on land. This is such a shame. You wouldn’t have any comfortable entrance to the water nor the chance to see the sandy beach. I was there in 2011 and the massive infrastructure was not there yet. It was much more beautiful, once this was a black sand beach. It’s gone now. I was sad and a bit angry for sure. But well, that is what most of people named as the measurement of a development, massive infrastructure. 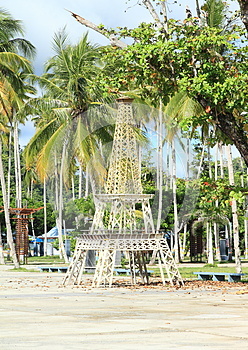 Instead of the unique pretty black sand beach, I saw a mini replica of Eiffel Tower and also a giant pair of dolphin figure at the entrance. Once it was raining heavily, we needed to take shelter so we decided to go to a restaurant near by the beach. I was so thirsty and cold, so I ordered some warm drink and also snacks. We were sitting there for about 1 to 2 hours, the drink didn’t even arrive. There wasn’t even a waiter to ask what’s happening. We was so livid and left the place. I mean, it was just a personal experience, it doesn’t mean that all the restaurant there are bad. Maybe we were just not lucky that day, but this is good thing to know. Actually, you could buy some food from the traditional market. It’s just aside the WTC beach, they sold cooked food, like fish, rice, chicken and also fruit and vegetables. Not so much thing to see and we had time before the other trip, so we decided to go to Wayag. That was an awesome idea, that could be such a remedy for my disappointment from the last cancelled trip to Fam Island (Pyanemo). Wayag is the best destination I’ve ever done in my life so far. The landscape was so mind blowing. The sprouting mushrooms like islands with the crystal blue water is heaven on earth. The island is known for its beautiful atolls and amazing underwater life. 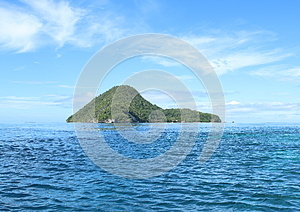 This islands is located just 10km from the equator. The beaches are just like a tropical dream, teasing you with the whispering zephyr. Wayag located quite far from Waisai. It takes around 4 hours by boat on a nice weather, that means 8 hours round trip. 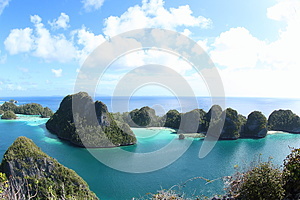 Wayag has one of the best scenic view in Raja Ampat, West Papua Indonesia. Make sure to visit the islands. You can read full story here Wayag Karst Archipelago. 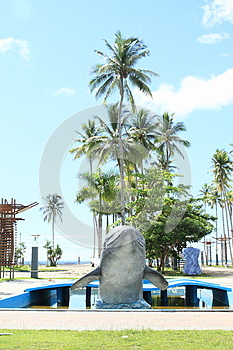 Arborek is named as the best village in the area of Raja Ampat Papua. This village became a pioneer among the 18 other villages in the social based local conservation of marine resources. So why you should come here? 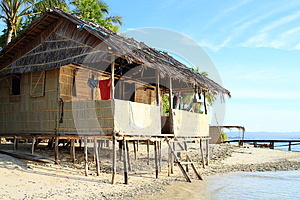 Here you will experience the coastal life of native people from Raja Ampat. It is seen from their nicely managed village. Art is a really important part of the daily life. They were dancing, singing, playing the traditional music instruments. It was an amazing experience for me. The traditional handcrafts are really famous. Women at the village are making handcraft such as hat or floor mat. The underwater life is magnificent. 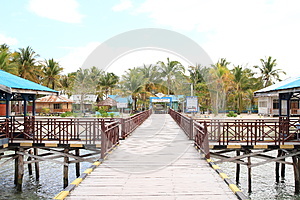 You can go for diving or just snorkling near by the jetty of the village. You will find groups of jelly fishes on tide and several school of fishes. Lovely colorful sunset. What is better than ending your day by sitting on the beach, having coconut water (or beer) and watching the sun setting? 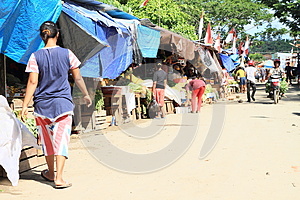 To read more about the Arborek Village, visit Arborek, The Raja Ampat Popular Touristic Village. Enjoy your journey through Raja Ampat.